American officials have said that President Obama reassured Saudi King Abdullah on Friday about US support for “moderate” Syrian insurgents and any nuclear deal with Iran. Obama arrived in Riyadh on Friday, amid Saudi concern about Washington’s retreat from the Syrian conflict and talks for a comprehensive nuclear agreement with Tehran. The official repeated Washington’s long-stated line that both countries share the objective of a political transition in Syria and supporting moderate opposition. On Friday, American officials used The Washington Post to declare once more that they might increase covert aid to the insurgency. 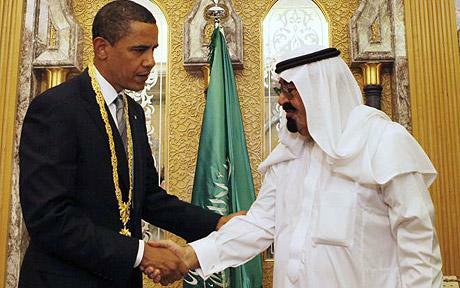 US officials said Obama did not have time to raise concerns about Saudi Arabia’s human rights record.